Parents are always welcome to visit their children at the Center and join their daily activities. 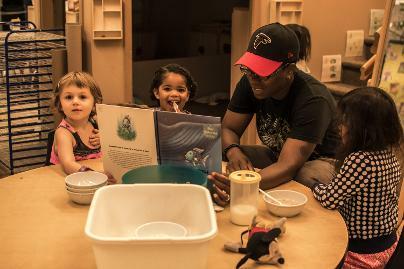 The children's experience is greatly enhanced when parents participate in special classroom activities, particularly those in which families can share their diverse ethnic, cultural, religious traditions and history. Parents are requested to provide information regarding their ethnic, cultural, and religious beliefs so we can incorporate our families’ cultures into our curriculum. We suggest reading a story, assisting with a craft, a cooking project, singing songs, sharing a dance or showing pictures. We especially encourage parents to join their children for lunch and special events. Our infant program welcomes mothers to come and nurse or visit their baby during the day. In addition, parents are asked to support the Center by participating in fundraising events, the proceeds of which help offset tuition costs. Parents are also welcome to join us on field trips. Periodically, the Center will coordinate special family events for parents to get to know each other. Parents are invited to run for a seat on the Board of Directors. As a member of the Board, parents have direct input into setting policies, approving the annual budget, raising extra funds to support the operating budget, and participating in short- and long-term planning for the program.